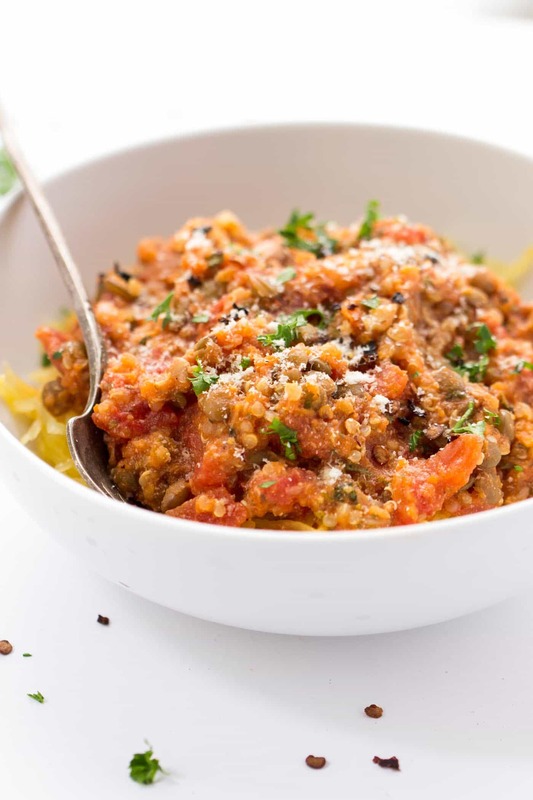 Today I'm partnering with my friends from Tuttorosso to not only give you this cozy lentil bolognese recipe, but to also talk about canned tomatoes. I've been using canned tomatoes my whole life. 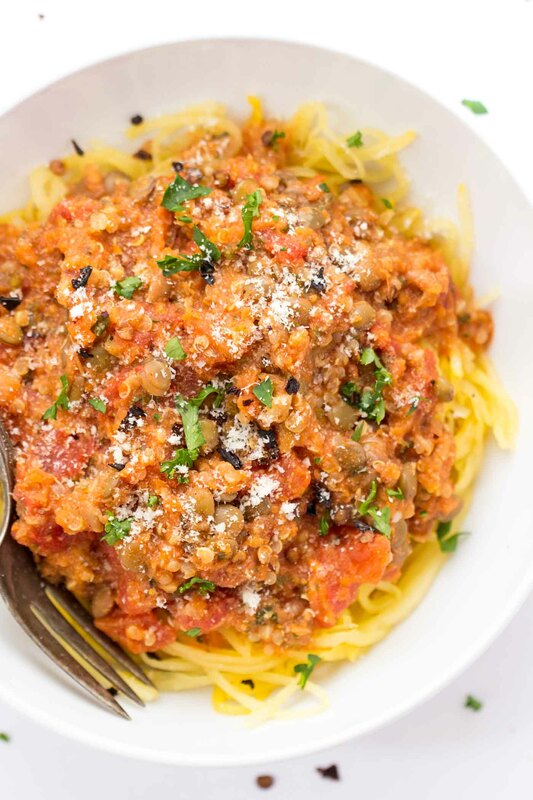 Growing up in an Italian family, my mom (and grandmother) would make spaghetti sauce from scratch all the time. 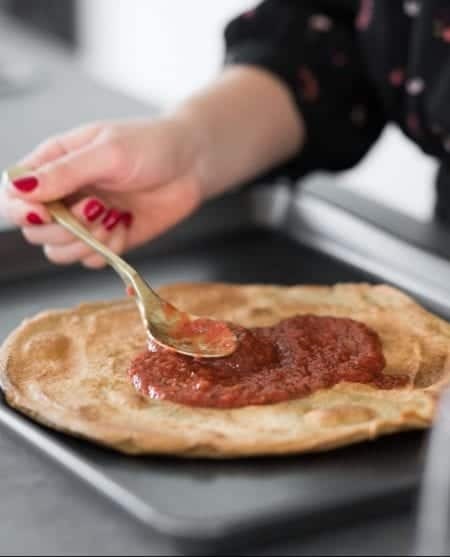 Without giving away our secret recipe, the base is a blend of a bunch of different types of canned tomatoes – sauce, paste, diced and crushed – so while I'm very familiar with those types, I do have to admit my knowledge of the whole peeled variety is somewhat lack luster. Which is why when Tuttorosso asked if I would be interested in being an ambassador, specifically talking about their whole peeled tomatoes, I jumped at the chance. Not only did I already love their tomatoes, but this was going to give me a chance to really explore how to use this type of tomato in my cooking. Our first challenge? 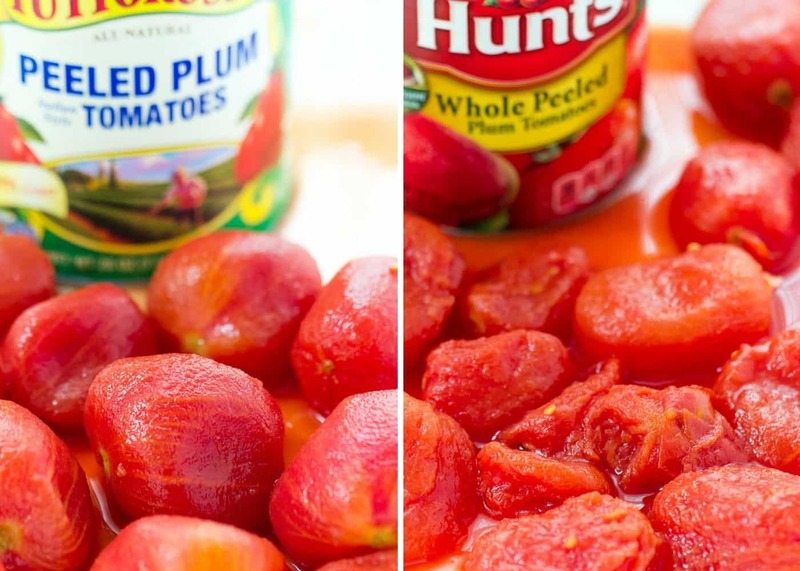 To compare the integrity of Tuttorosso tomatoes vs. Hunts tomatoes. At first this challenge sounded kind of silly, but as soon as I cracked open the cans I realized why we were doing this. If you're anything like me, then you've probably never thought about what the whole tomatoes look like when they come out of the can. So you can imagine my surprise when I poured out both cans and the difference was incredible. Not only was the color a lot more vibrant, but it was how the actual tomatoes looked. The Tuttorosso ones were actually whole. I mean…what a novel concept, right? Whole peeled tomatoes that come out of the can WHOLE. Hunts on the other hand? Some were whole, but most were smashed. It kind of makes you think, doesn't it? What's different about some canned products? So I started doing a little digging and what I came to discover was that, unlike other popular brands (like Hunts), Tuttorosso not only doesn't use preservatives, but their tomatoes are also sustainably produced, non-GMO verified, have no artificial colors or flavors, are allergen free, are made in the US AND they're in non-BPA lined cans. When it got to cooking with them, I wanted to try something a little different than I'm used to. I was initially thinking a stew, but I got pulled back to my Italian roots and decided on a vegan bolognese instead. 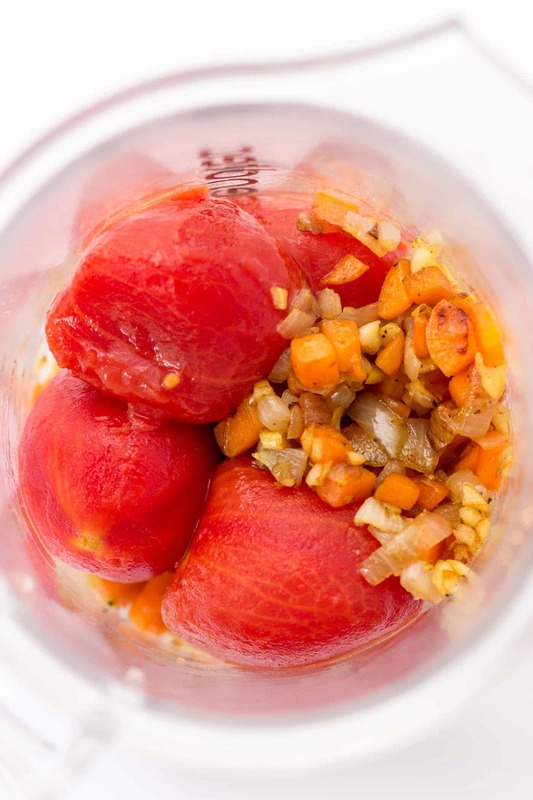 The beauty of this sauce is you only need one can of tomatoes and it's packed with veggies. The base is tomatoes, carrots and shallots and the “meatiness” comes in the form of lentils and quinoa. Similarly to my chilis, adding quinoa to the sauce helps it thicken it, but also provides the illusion of ground meet. 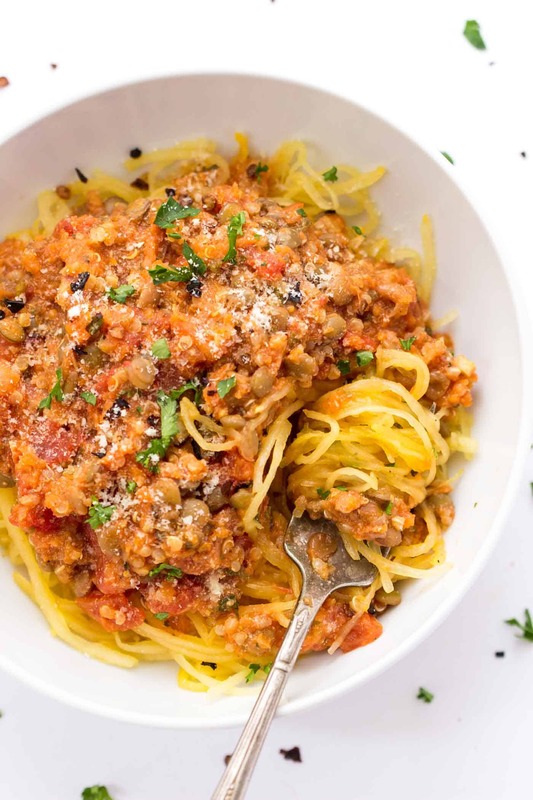 Plant-based, high in protein and looks like a meat sauce? Perfection. Also, I like my sauces super thick, so rather than using tomato paste, I decided to puree some of the tomatoes with the carrot-shallot mixture. This helped make the bolognese hearty, but still light because it was only vegetables. 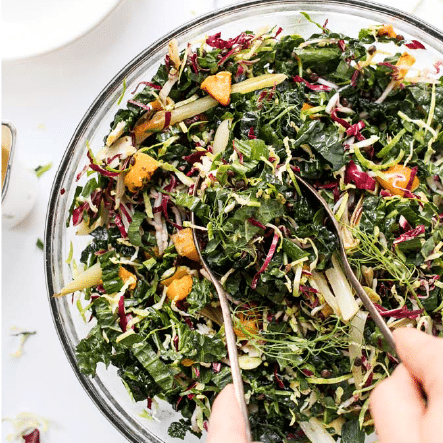 OH annnnnd to keep it as light as possible, we're serving this beaut over spaghetti squash. 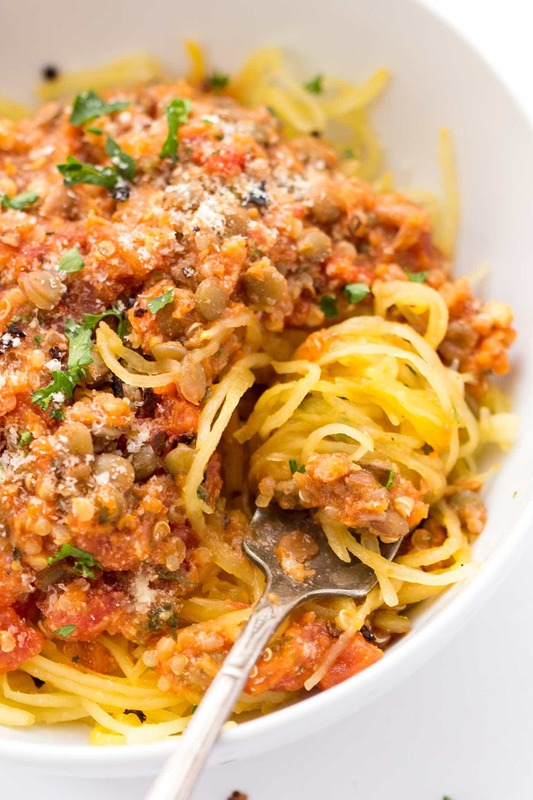 If you haven't discovered spaghetti squash yet, this lentil bolognese is probably one of the best trials. Because for those who are a little wary of the sqaushy flavor (like Matt), the sauce masks the flavor every so slightly and the spaghetti squash ends up really just acting as a serving vessel rather than the main focus of the meal. Although my Italian side of the family would (and probably will) be slightly horrified to read that I made a bolognese sauce sans ground meat and red wine, I will say, I'm totally digging it. In fact, it really couldn't be more up my alley these days. I'm really enjoying turing my meals into meatless adventures and honestly feel like the more beans I'm eating, the better I'm feeling (more on that whole situation later). For now, it's all about having simple, easy and affordable meals that we can make in a snap and still enjoy just as much as if there were meat inside. What do you think about trying to make healthier, meatless meals a few days per week? If your family hasn't started doing this, is there something stopping you? And if you have, what are your favorite meals? I'm always looking for weeknight meal inspiration, so please share any of your favorite recipes below! And don't forget about the tomato test! I'm definitely planning to apply these principles across all my canned goods – making sure that if I'm buying canned it's the highest quality possible. 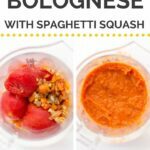 Prepare the spaghetti squash according to this recipe/method. While spaghetti squash is roasting, make the sauce. Drain the tomatoes from the can. Set 4 - 5 whole tomatoes aside and the chop remaining, reserving as much juice as possible. Heat a skillet over medium heat with about 1 tablespoon of olive oil. Add carrots, shallots and garlic and saute until garlic is fragrant, about 2 - 3 minutes. Season with salt and pepper. 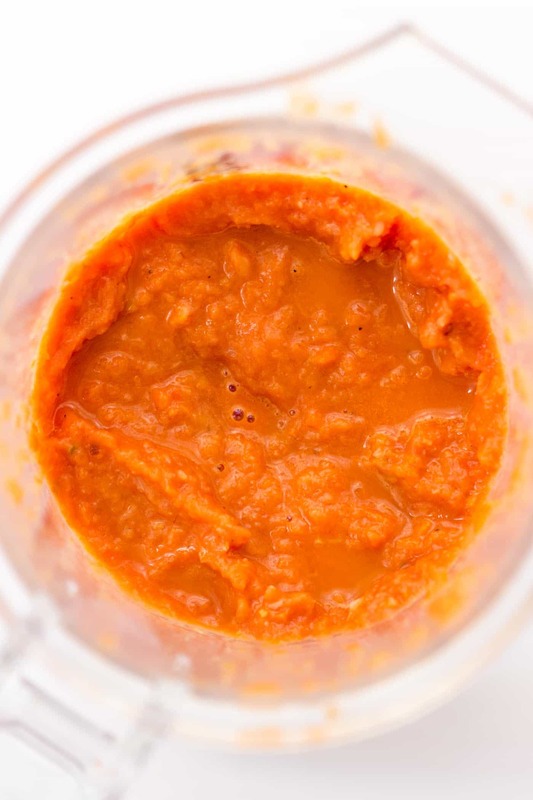 Transfer carrot-shallot mixture to a blender along with whole tomatoes that you set aside. Add 1/4 cup of tomato juice from the can (also called the media) to the blender and puree on high until smooth. Return sauce to the skillet. Stir in chopped tomatoes, remaining tomato juice/liquid, and the other remaining ingredients. Stir and allow to come to a small simmer. Allow mixture to simmer for 10 - 15 minutes to let the flavor develop, tasting and seasoning with salt and pepper about half way through. This was so delicious and it introduced me to spaghetti squash. Great recipe!! Is the nutrition information for the entire recipe? Is that calorie count accurate? Seems really high. Thanks! I can’t tell you how much I have truly enjoyed this recipe! It’s so fresh tasting that I’m not sure I’ll ever make regular bolognese sauce again. It’s easy to take to work as a lunch, reheats nicely, always filling and tasty, plus extremely good for you! “Thank you!” just doesn’t seem like enough. I’m so happy to hear that. Thank you, Nancy! 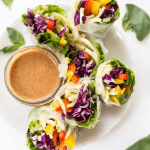 I just tried this recipe for my first ever Meatless Monday and it is DELICIOUS! I’m wondering how many calories this meal has per serving? Seems like it would be a lower calorie, healthy option for those of us trying to improve our eating habits. Thanks for such a wonderful recipe, I’m thrilled to have started a new adventure on such a tasty dish! One of my favorite vegetarian recipes yet! Absolutely delicious. My husband doesn’t like when I cook spaghetti squash with olive oil, Parmesan, and sauteed vegetables, but he loved this. I supposed this recipe probably hides the flavor of squash a bit more than a light sauce. I don’t usually like to eat leftovers but this one was wonderful left over, as well! & I love all the protein I’m getting from one meal! This recipe, Quinoa + Lentil Bolognese with Spaghetti Squash was quite TASTY. I over cooked the lentils, despite over cooking them it was still very tasty. We, my finance and i, really dig the squash part of the recipe, totally replaces traditional pasta. 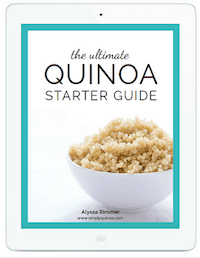 My fiance finds herself at your site quite a bit, we’ve tried 4 recipes already. So far, all have been quite good. I think my favorite thus far is the Coconut Curry Bowl. Sounds very yummy! I’ll definitely try it! Thanks for sharing! I have stopped using canned Tomatos a while ago, and now only buy them in a glass jar. Research shows that the tomatoes being acidic, absorb lots of the BPA that the tomato cans are lined with, which is very toxic, especially for kids. Thought I would share! Thank you for all the wonderful recipes! I’m glad I stumbled over your blog! Have a great weekend!! This recipe was shockingly delicious! I even used the Tuttorosa tomatoes… I added abt 3 TBS of sherry wine and four sundried tomatoes to make it my own, otherwise followed the directions precisely. It’s so filling and satisfying- we had ours over gluten free pasta. I mixed my leftovers today with arugula for lunch. Amazing recipe! Thanks so much!! This looks amazing Alyssa! I have all of these ingredients at home, so you better believe I’ll be making this this week! I made this for dinner last night, it was AMAZING!!! I had to stop my self from eating more or I wouldn’t have leftovers for the week 🙂 I used Kelp noodles instead of squash but next time I’ll try with the squash, thank you!! Yay! So glad that you enjoyed it 🙂 I haven’t tried kelp noodles yet…what do they taste like?? I gotta get some! I get the kelp noodles at Whole Foods, the brand is Gold Mine. They don’t need to be cooked, just rinsed. If you don’t heat them they are crunchy which is great for salads or when you add a sauce or broth that is warm they take on the exact texture of a pasta noodle. And they only have 6 calories per serving 🙂 They really do not have a distinctive flavor, they absorb what you are adding to them. This is perfect! 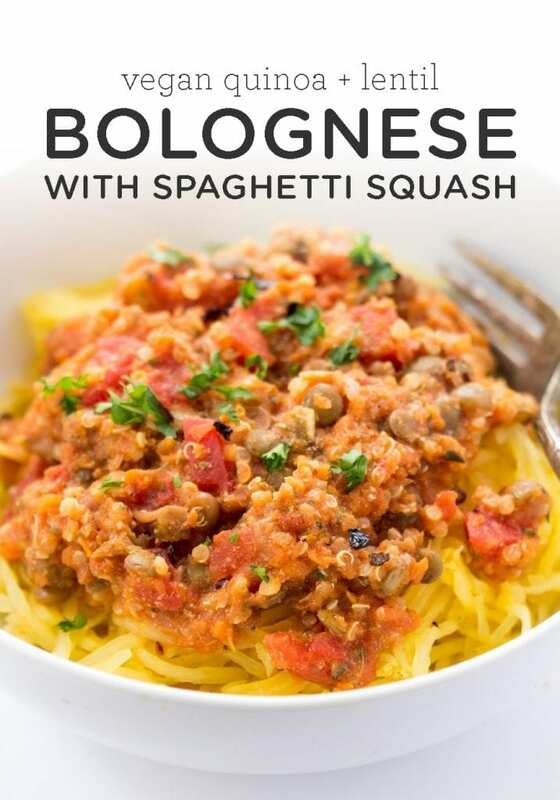 My boyfriend just discovered his love of spaghetti squash and lentils, so I have to make this for us ASAP. So hearty and comforting!! How did you cook the lentils? What is the measurement of dry lentils to get 1 cooked cup? How did cook the lentils? good. recipe that is. have you considered buckwheat pasta? its awesome, and its not wheat at all. it”s a seed. i love it. Haven’t tried buckwheat pasta yet because I haven’t seen one that’s 100% buckwheat. I’ve heard great things though! King Soba Noodle Culture noodles are 100% buckwheat. They are very yummy. I’ve had to order them onlne because I haven’t found a store near me that carries 100% buckwheat noodles either. If you’re interested in trying them, these are yummy, but spaghetti squash is hard to beat. So hard choice. But thanks for the very yummy bolognese, Alyssa. I love it. So far the almost 1 year old likes it too. The hubs hasn’t tried it yet, but I’m sure he’ll like it too! Where are the lentils and quinoa incorporated? I read the instructions twice and there are no mention of them. Are they precooked, to add to the sauce? Or do you warm them up? Or do you make them separate while making sauce? If cooking since I wouldn’t have lentils and quinoa on hand, would the recipe still take 30 minutes or longer? Lentils and quinoa are AWOL! Hi Alice! Both the lentils and quinoa are pre-cooked. And you add them in step 5 where you stir in the remaining ingredients. 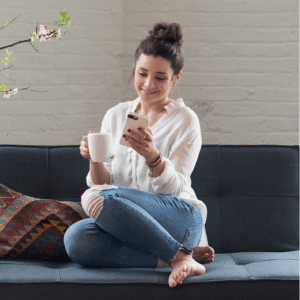 You’ll want to do that just before you let it simmer. Hope that helps 🙂 Let me know if you have any more questions! Whew! I can handle that much better!